Mobile Operators across the world face the same problem; their traditional core revenues are in decline and their operational costs are increasing. 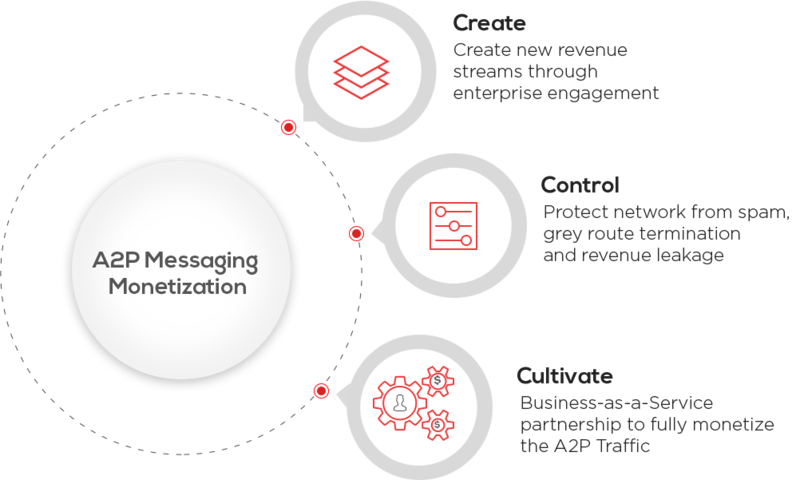 A2P messaging offers an opportunity to generate new revenues that plug that cost-revenue gap and create new profit lines. Our Business-as-a-Service partnership provides a fully-managed end-to-end product lifecycle support for all our customers. We maintain industry security standards, infrastructure, manage business & technical operations, Iinvoicing, Collections and Revenue Assurance, all resulting in faster time to market, cost reduction and less strain on your business processes. We own our products & solutions and have no third-party dependency to adapt to this changing world. Bringing you the highest deliverability at the lowest latency. Experience a 99.95% uptime SLA made possible with automated failover and Zero-maintenance windows. We currently process more than 7 billion messages per month, our platform can scale to your needs, no matter how big you get. No hidden costs and pay-as-you-go pricing, 24/7 support, and the freedom to scale up or down without contracts. Questions? We'd love talk to you.